The Destination Trail Fragrance Lake Half Marathon traditionally takes place mid-February in the throes of winter. However, due to an incredibly tragic plane accident that occurred on course days before the race, the race was cancelled and rescheduled for June 9th. Fragrance Lake typically has the potential to be chilly, muddy, icy, and/or snowy with many downed trees to navigate around, over or under. 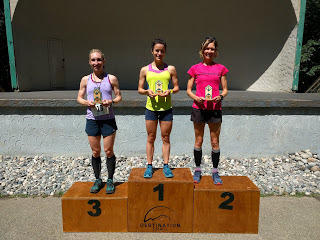 With this May being the driest month on record in Bellingham, the trails were in prime condition for a course PR despite the day’s previous rain showers. Looking for the men ahead. The Fragrance Lake ½ course went the long way around the lake this year like in 2016. Otherwise, everything remained the same: still the same 3,300 feet of climbing in the first 7 miles, then a trip across the Ridge, concluding with spiraling down Fragrance Lake Trail. Without David Laney present to take the start out screaming fast, the first mile was relatively calm, and I kept the lead men in site before catching up on the first climb to Two Dollar. I shared a couple of miles with Paul Sage from Club Northwest, but once he pulled off to take the finish for the simultaneous 10km, I was on my own. At one point on Lost Lake trail, I saw a glimpse of the leader, Matthew Logan, but my climbing legs were screaming “not today!” so I trudged on with only my past splits to use as a reference. I knew two miles in it was going to be near impossible to run my best time today, but that didn’t stop me from pushing my hardest. Coming off the Ridge and on to Cleator Road for the final bump up, Tad said that a woman was only about a minute behind me as I entered the Ridge and I better push it from here to the end. Aw man! Not the news I wanted to hear today. My legs were burning so bad on any slight incline. I gritted my teeth and ran down Fragrance Lake Trail like a crazy person. Luckily, my loud breathing warned hikers far in advance and they kindly stepped to the side, and my downhill legs were surprisingly awesome. When I bottomed out at Fragrance Lake Trail, Tad was there and asked me if I passed the lead guy. I knew that I hadn’t, so I wasn’t sure what he was talking about. I sprinted to the finish and embarrassingly missed the finish shoot so I was spinning my wheels in the gravel trying to quickly make the turn and cross the finish line. Eighteen seconds later, Matt came through. He missed reading a course sign and unfortunately took a wrong turn. Had he not, he would have gotten me by a couple minutes. It was Stacey Cleveland from BC who was hot on my heels, finishing just 3 minutes back; she ran so strong! I got lucky today, that's for sure! This is my fourth year in a row running the race and my slowest time yet. Of course, that doesn’t sit well, but I know that had I backed off on mileage and rested the results would have reflected that. sunny. Also perfect for hanging out, eating, and drinking beer while we cheered on our fellow friends and racers. Bracing myself for the final push.